The night of al Qadr is a special night that all of Muslims wait for the whole year. Allah informs us that He sends down the Quran on the Night of al Qadr which is in the month of Ramadhan. 3. we sent it (this Qur’ân) down on a blessed night [(i.e. night of Qadr, Sûrah No: 97) In the month of Ramadân,, the 9th month of the Islâmic calendar]. Ibn Abbas explained about the revelation of the quran by its timeline. Allah knows best. Ibn Abbas stated that the Quran was first separated from its station in the upper heavens and placed in Bayt al Izzah in the lowest heaven. Had it been Allah’s wish, the Quran could have been revealed as a whole to the Prophet sallallahu alaihi salam in a single revelation. This was how the earlier books of revelation were sent down. 106. and (it is) a Qur’ân which we have divided (into parts), In order that You might recite it to men at intervals. and we have revealed it by stages. (in 23 years). Allah would say the Quran and the Angel Jibreel heard the Quran from Allah. Allah spoke the whole Quran and is preserved in Lawh al mahfudz. Then Allah sent the whole Quran to Baitul Izzah in Ramadhan on the Night of al Qadr. Then Allah commanded Jibreel to send down revelation that He has spoke, to Prophet Muhammad sallallahu alaihi wasalam. This process took 23 years to complete. The first verses revealed are the first five ayat of Suratul Alaq. 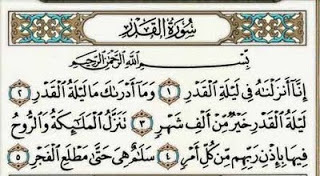 The first complete surah revealed is surah al Fatihah. The last complete surah revealed is suratun Nasr. Muhammad (sal Allah alaihi wasalam) would receive revelation, from Jibreel, like the loud ringing of a bell until he comprehended the revelation. This was so heavy that He would sweat alot even on a cold day. [Bukhari, Kitab al Wahy/Revelation]. Prophet Muhammad sallallahu alaihi wasalam would memorise what he was taught. Muhammad (sal Allah alaihi wasalam) in the early times of revelation would sometimes recite while Jibreel is reciting the Qur’an to him in haste, in order to make sure that he is memorising the Qur’an properly. But Allah told Prophet Muhammad (sal Allah alaihi wasalam) that He would preserve it for Him in his heart. Surah al Qiyamah 75:16-18]. 16. move not Your tongue concerning (the Qur’ân, O Muhammad Sal-Allaahu ‘alayhe Wa Sallam) to make haste therewith. 18. and when we have recited it to You [O Muhammad Sal-Allaahu ‘alayhe Wa Sallam through Jibrael (Gabriel)], Then follow You its (the Qur’ân’s) recital. Then Prophet Muhammad (sal Allah alaihi wasalam) would tell his companions that he has received this revelation that will lead to many of them memorizing and recording it down. Sometimes he sallallahu alaihi wasalam would receive a complete surah (i.e. surah Kawthar). Sometimes part of a surah. Sometimes he would receive one or a few verse/s, and would be told by Jibreel to place a certain verse in a certain location in a specific surah (i.e. between two other verses). Prophet Muhammad would then tell his companions to do the same with any memorization or writing they had done. The order of the verses/aayaat in each surah has never been altered by anyone. Nay! This is a Glorious Qur’ân, (Inscribed) In Al-Lauh Al-Mahfûz (the preserved Tablet)! 12. Verily, we give life to the dead, and we record that which they send before (them), and their traces [their footsteps and walking on the earth with their legs to the Mosques for the five compulsory congregational prayers, Jihâd (holy fighting In Allâh’s Cause) and All other good and evil they did, and that which they leave behind], and All things we have recorded with numbers (as a Record) In a clear book. by the Mount; and by the Book Inscribed. In parchment unrolled. 4. and Verily, it (this Qur’ân) is In the mother of the Book (i.e. Al-Lauh Al-Mahfûz), before us, indeed Exalted, full of wisdom. Shaykh ‘Abd ar-Rahman as-S’adi (may Allah have mercy on him) said: That is because every time something of the Quran was revealed to him, it increased him in certainty and steadfastness, especially when there was cause for anxiety. The fact that the Quran was revealed when new developments occurred meant that it had greater impact and was more reassuring to the Prophet (peace and blessings of Allah be upon him). And that was more effective than if it had been revealed before that, then was remembered when the new developments occurred. And (it is) a Quran which We have divided (into parts), in order that you might recite it to men at intervals. And We have revealed it by stages. Shaykh ‘Abd ar-Rahman as-S’adi (may Allah have mercy on him) said: “at intervals” means at an easy pace, so that they might ponder it and think about its meanings, and derive knowledge from it. JzkAllahu kheyran for this amazing post.. May Allah reward you.. You mentioned that one of the names of the Lahw Al Mahfooth is Oum Al Kitaan.. Isn’t it supposed to be Oum Al Kitab? (I think this was a typo). I only mention this in case someone wrongly transmits it from you’re post. InshAllah you can delete this post after fixing it. BarakAllahu feyk. Jazakallahhu Khayr. I have corrected the typo error. I really do appreciate the correction.